Kelso Abbey was the site of the crowning of James IV in 1488. 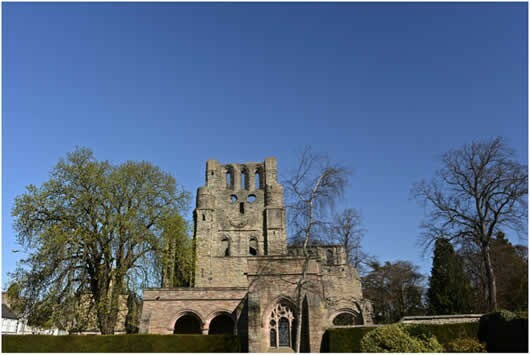 It is said (but unattributed) that some of the dead of the battle were returned to Kelso Abbey for burial in the days following the defeat of the Scottish army. The town itself has many connections with Border history and especially with Sir Walter Scott. The Battle of Flodden (1513) marked the beginning of the end for this iconic building, its inhabitants and lands. 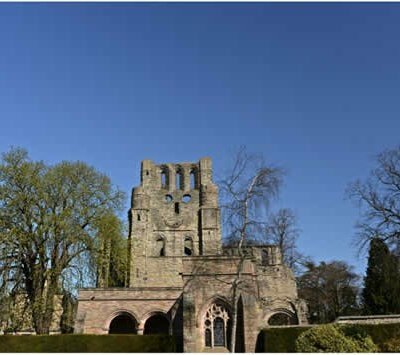 Taking advantage of the confusion after Flodden, Dand Ker of Ferniehurst broke into the abbey immediately after the battle and installed his brother Thomas as the 30th Abbot. The army of the Earl of Hertford destroyed the walls during the War of the Rough Wooing (1545) and stripped lead from its roof to make bullets. Open access to Kelso Square and Roxburgh Castle. Kelso Square has shops, cafes, banks and a hotel. Limited parking is available. The ruins of Roxburgh Castle have steep embankments and care must be taken when walking on them. The Knowes Car Park in Kelso (TD5 7BH) is the most convenient for all the sites. Kelso lies at the heart of the Scottish Borders. The four major trunk roads leading to and within the Borders are the A1 in the East, the A7 and A68 in central Borders and also the A697 from the South. The main roads into Kelso are the A698 from Berwick, the A68 from Newcastle or Edinburgh and the A699 from Selkirk.